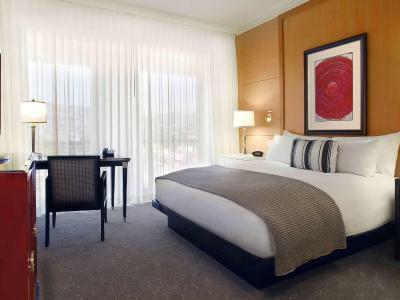 Lock in a great price for Hotel Sofitel Los Angeles at Beverly Hills – rated 8.2 by recent guests! 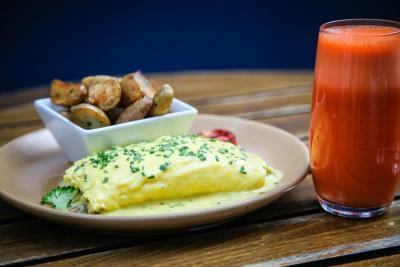 Beautiful rooms, great service and an amazing brunch! Very comfortable room and outstanding location. Very nice hotel! Comfy beds, great location! Highly recommended!! The staff was amazing. Super helpful and friendly. The mattresses are very comfortable and the rooms were nice. The hotel staff were amazing! They gave us a little present for our wedding which was a lovely surprise. The beautiful card with the staff’s well wishes certainly goes a long way to making our stay so much more memorable. Thank you Sofitel! Also the bed was so soft and comfortable that I didn’t want to get up! Love the bed! The gym was also fantastic! We will definitely stay with Sofitel again! Bartender at the bar on Saturday late afternoon was very nice. Super comfortable bed and spacious room. The staff were also very helpful and friendly. I would stay here again when in LA. The bed was sooo soft and comfortable. The bathroom was fantastic. My maid was super nice. The restaurant was superb. The staff are very helpful and accommodating. It’s also convenient for visiting the places we were interested in. 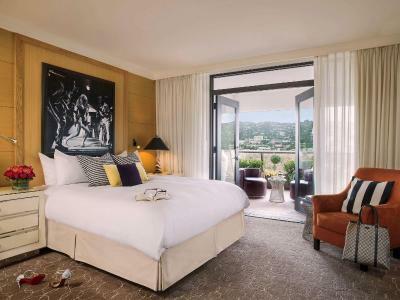 Hotel Sofitel Los Angeles at Beverly Hills This rating is a reflection of how the property compares to the industry standard when it comes to price, facilities and services available. It's based on a self-evaluation by the property. Use this rating to help choose your stay! One of our top picks in Los Angeles.Located 3.1 mi from Rodeo Drive, Hotel Sofitel Los Angeles at Beverly Hills features a luxury spa, a gourmet French restaurant, a heated outdoor pool, and elegant rooms with free WiFi and spacious bathrooms. The Beverly Center shopping mall is across the street from the property. The spacious, modern rooms at Hotel Sofitel include a high definition TV, an iPod docking station and a work desk. All rooms have city views and floor-to-ceiling windows. 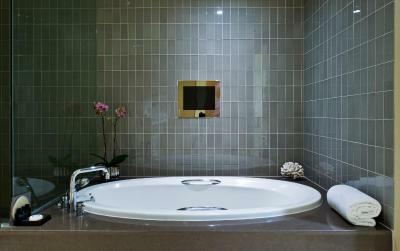 Private bathrooms offer glass-enclosed rainfall showers and French bath amenities. The pool offers a poolside bar during the Summer months. There is also an on-site salon for guest use and a full spa. The on-site bar features digital artwork and a full outdoor patio equipped with seats. Estérel, located on site, serves regional French cuisine with meals infused with accents of fennel, saffron and herbs de Provence. Guests may dine indoors or beside the gardens and fire pit on the outdoor terrace. Guests can also relax at Riviera 31, a chic lounge offering an assortment of fine wines and specialty cocktails. LeSpa at Hotel Sofitel Los Angeles at Beverly Hills features an outdoor pool, gym and a variety of face and body treatments. A business center, tour desk and on-site shops are also available. The state of the art gym provides guests with cardio machines, strength training stations, weights, and a steam room. West Hollywood and Sunset Boulevard are just 5 minutes' drive away from Hotel Sofitel Los Angeles at Beverly Hills. The Grove shopping center and the original Farmers Market are 6 minutes’ drive away. When would you like to stay at Hotel Sofitel Los Angeles at Beverly Hills? 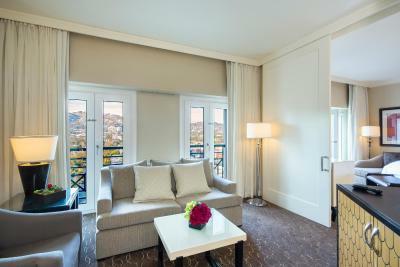 Offering free Wi-Fi, this suite features a separate living room, 3 TVs, and French doors with balcony offering Hollywood Hills views. Room size and configuration may vary. Offering free Wi-fi, this air-conditioned luxury room features french doors that lead to a small balcony. It includes a flat-screen cable TV with pay-per-view channels and an iPod docking station. - Please note: No rollaway beds are available for this room. 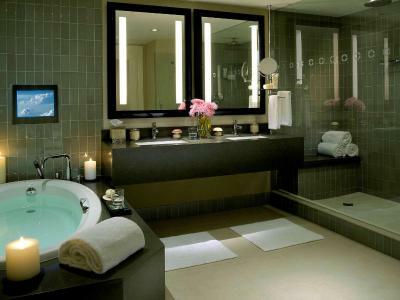 Offering free Wi-Fi, this room features luxury bath products. 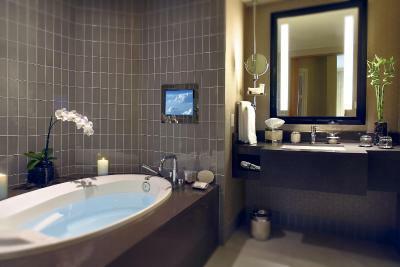 Offering free WiFi, this luxury room includes a flat-screen cable TV, and an iPod docking station. 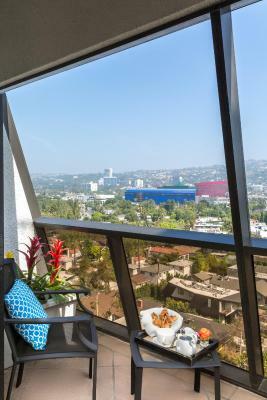 Views of the Hollywood Hills are also included. Offering free Wi-Fi, this air-conditioned room includes a flat-screen cable TV with pay-per-view channels, an iPod docking station, a mini-bar and guest slippers. This double room features a mini-bar, bathrobe and cable TV. This double room has a iPod dock, air conditioning and mini-bar. This suite features air conditioning, iPod dock and flat-screen TV. This suite features a bathrobe, air conditioning and cable TV. 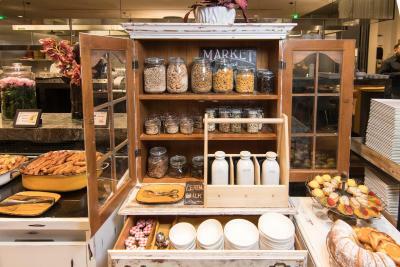 House Rules Hotel Sofitel Los Angeles at Beverly Hills takes special requests – add in the next step! Hotel Sofitel Los Angeles at Beverly Hills accepts these cards and reserves the right to temporarily hold an amount prior to arrival. Please note: The property reserves the right to preauthorize credit cards for the first night room and tax for stays 7 nights or longer. Please note: Children 12 and under may enjoy complimentary breakfast off of a selected menu with purchase of adult breakfast. Hotel has everything to turn it into a 5 star hotel, except for friendly staff and personel. Worst check-in experience ever and un-interested staff. Not their fault but their management. Don’t expect Euro quality Sofitel. The check in guy could have been a bit friendlier. Beautiful, comfy room. Nice view. Shower floor is very slippery and bathroom/shower needs some updates especially for being basically in the heart of Bev Hills and requiring a higher rate then other similar properties. The bed was pathetic for a nice hotel. Way too soft and the pillow top was too worn...no support. My back still hurts. Their restaurant menus were ridiculous. All that was offered/pushed for breakfast was the buffet, which I did not want...so I actually walked out! Lunch menu very limited and practically had to negotiate to get a salad with grilled chicken...which, of course, also was not on the menu. I have NO reason to ever go back to this hotel. Didn't really like anything but the location. Everything was great about this hotel stay with the exception of the connected bar in the hotel. Events were taking place and the smell of marijuana was prevalent throughout the hotel lobby. Other than this issue, we loved our stay. Location is perfect, directly in Beverly Hills close to best shops, cafes and restaurants! Hotel Lobby is stylish. Rooms are nice and big but make sure you get a room facing the hills in an upper floor. Rooms to Beverly boulevard can be noisy. The staff were excellent. One security guard incident that was disturbing, but all else was 10/10. Our mattress wasn’t very comfortable. Also wasn’t too thrilled about the valet only option. Once in our 4 day trip took a little longer than the rest of the days.